1. Cut twelve wedges of watermelon so that the wedges are ½-inch thick and shaped roughly in 3 x 3 x 3-inch triangle with rind removed. 2. In a medium bowl, combine the feta, parsley, black pepper and olive oil. Toss gently to combine. 3. 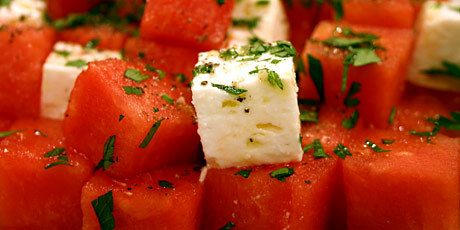 Sprinkle watermelon wedges with some of the feta mixture. Serve immediately.